Lightly butter an 8-inch square baking pan or dish. With an electric mixer, in a medium mixing bowl, beat the butter, Splenda, applesauce, egg, and vanilla extract on medium speed. Slowly add the cocoa and flours, beating until well combined. 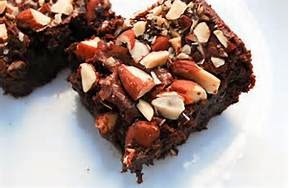 Mix in 1 tablespoon of the almonds and pour the batter into the prepared pan. Top with the remaining almonds. Bake brownies for 25 to 30 minutes at 350 degrees, or until a wooden toothpick inserted in the center comes out clean. Do not overbake brownies. Cool in pan on a wire rack until completely cooled. Cut and serve.